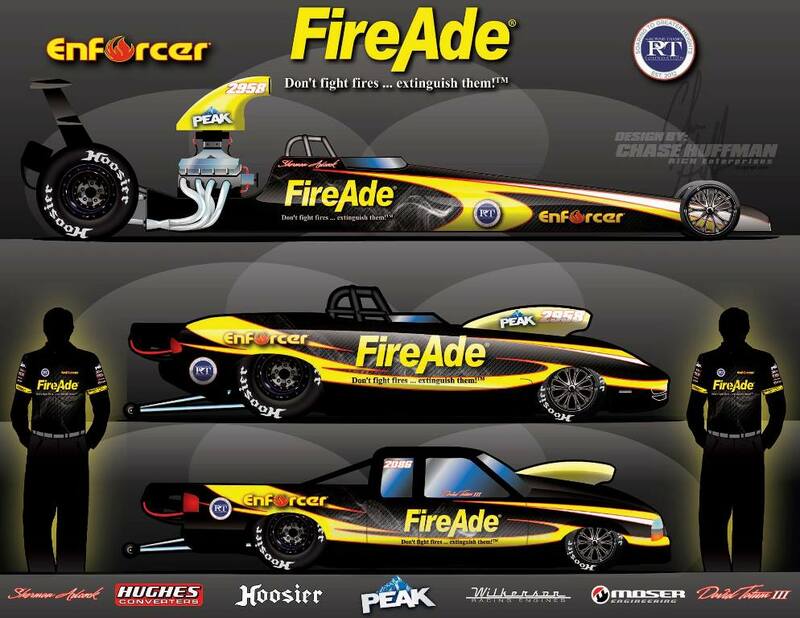 Team Adcock and long time partner David Tatum III announced a new marketing partnership today with Fire Service Plus, better known as FireAde and their Enforcer line of fire suppression products. "Along with FireAde, It is truly an honor to be associated with the RT Foundation and all the powerful work they are doing in recognizing and supporting our first responders around the country." pointed out Adcock. "Fireade has been and continues to be on the cutting edge of clean efficient fire suppression. Team Adcock / Tatum are proud to align themselves with such an outstanding and important organization. Myself and Tatum are thrilled to be brand ambassadors and are challenged to take the Fireade and Enforcer brand to the racing public." stated Adcock. At the time of the press release all 3 entries for the team are being prepared in their new FireAde livery. Testing will commence soon with a full NHRA schedule to follow.